One night last week we made our way to La Madeleine for dinner. 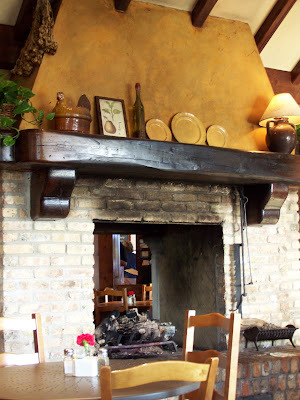 It is a quaint french bistro type of place. You order hot food when you walk in the door and can then get salad, soup or other sides through a "cafeteria" style line. The tables are old and worn hard wood. The decorations are homey and the food was incredible. 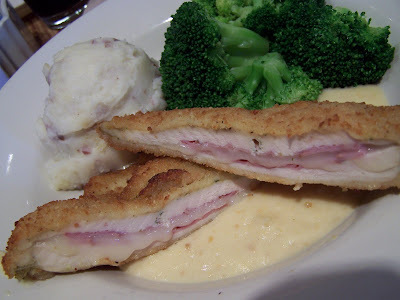 I had the chicken cordon bleu and was so pleased with it...in fact it was the best I'd ever had (well at least a very close second to Gary's from the Quilted Bear). We'll be visiting that place again I can tell you that. It's nice to get gift cards to random places or we'd probably just stick with the chains we're used to. 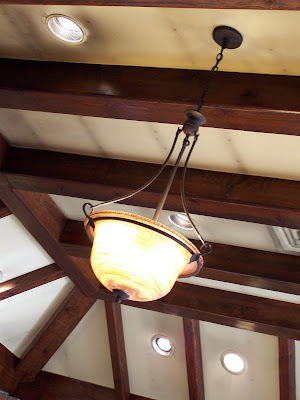 La Madeleine isn't everywhere but if it is near you I suggest you check it out. We also had a gift card to Bucket Brigade BBQ and checked that out on Saturday night. This is a whole in the wall kinda place that you'd miss if you weren't looking closely and you'd probably pass by if you were looking for a fine dining establishment. But let me tell you, this is one place you should not pass by. The food was great, the atmosphere was nice and the cook/waiter/cashier /jack of all trades was a great host and all those other things. The food was great and we enjoyed our evening. It kinda feels like a family reunion kind of place. We will visit that place again and take any visitors we have there also. It's great to support those mom and pop type of places with the real home cookin' and bbq that beats any large chain resturants hands down. I'm looking forward to those left overs!! YUM!